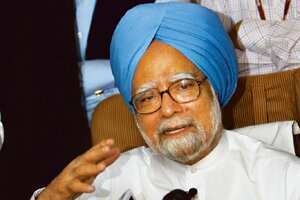 On Board PM’s Special Aircraft: Prime Minister Manmohan Singhon Sunday ruled out early Lok Sabha elections in the wake of the worsening global economic downturn and fears of its adverse impact on India. “It (economic crisis) has no bearing on elections. The elections will be held on schedule," he told journalists accompanying him in his special aircraft on way back from Washington where he attended a summit of Group of Twenty, or G-20, leaders. Singh was asked about the possibility of the global crisis forcing government to go for early elections or change any plans for early polls in view of the fears the crisis has stoked. To another question, Singh said his government has performed reasonably well and he sincerely hoped that the people would repose their confidence in them. Also Read“Balance of power shifting to emerging economies: PM"
Asked how realistically he felt that the approaching elections would impact the government’s response to the crisis, he said, “The crisis is not our making. I would like the people of India to judge us by the response of the government to the crisis." “We acted in time. While the rest of the world is in gloom we will still maintain a growth rate of 7.5%. The goal is growth with stability and more inclusive growth is a reality and will remain a reality despite the onslaught of adverse turn on our external environment," he said. Elections to constitute the next Lok Sabha are due before the last week of July 2009.